ANDREW JACKSON. 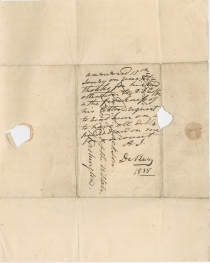 Autograph Endorsement Signed with Initials, January 17, 1836. On RENÉ E. DE RUSSY, Autograph Letter Signed, to Andrew Jackson, West Point, January 12, 1836. 3 pp., 8 x 10 in. West Point Jany 12th 1836. Prest of the U States. I have the honor to inform you, that I have lately used my best endeavours to prevent your nephew A. J. Coffee from having the number of Demerit marks which necessarily would by the Regulations, remove him from this Institution, but the careless habits he had previously acquired, rendered it impossible. Should it be the intention of young Coffee’s friends to have him re-appointed, I would Respectfully recommend to them, to let him spend the next six months at a School where he can perfect himself in the English Grammar and in History; his early Education has evidently been neglected and he has not yet acquired a proper habit of Study. Aware of the interest you are pleased to take, in the future welfare of this young man, I have presumed to Express, in a frank and candid manner the result of my observations in relation to him; he has been careless and inattentive, but I have the gratification to inform you, that he has evinced no disposition to vicious habits, and I have reason to believe that knowing as he does the cause of his present difficulty, he will in future Exert himself to regain the time which he has unfortunately mis-spent. I have directed his accounts to be closed, and agreeable to your wishes, will allow him to join you as soon as he can make necessary preparations. 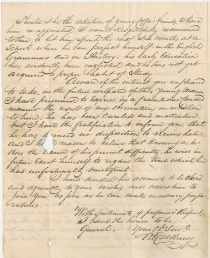 René E. De Russy, the Superintendent of the United States Military Academy at West Point, wrote to President Jackson about the dismissal from the Academy of Jackson’s grandnephew Andrew Jackson Coffee. Despite the advice, Coffee never returned to West Point but did serve as an army officer in the Mexican War. Andrew Jackson Coffee (1819-1891) was the son of General John Coffee, General Andrew Jackson’s trusted lieutenant in the War of 1812, and Mary Donelson Coffee, Rachel Donelson Jackson’s niece. As a grandnephew of Andrew Jackson, Coffee grew up near the Hermitage, Jackson’s plantation. After leaving West Point, he became a civil engineer, served as a paymaster in the U.S. Army, and was an aide-de-camp for Zachary Taylor in the Mexican War. His actions at the Battle of Buena Vista in February 1847 earned him promotion from major to lieutenant-colonel. 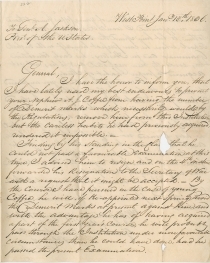 General Taylor selected Coffee to report personally to President James K. Polk about the battle. From 1853-1859, Coffee was an army surveyor in California. In his later years, he lived in Oakland and in San Francisco, where he made his living as a notary public. René Edward De Russy (1789-1865) was born in the French colony of Saint-Domingue (now Haiti), and his family moved to Virginia, in 1791. He graduated from the United States Military Academy in 1812, at the bottom of his class. He worked as an engineer in the U.S. Army and served as Superintendent of the U.S. Military Academy at West Point from 1833-1838. During the Civil War, he rose to the rank of brigadier general, serving in California until his death on active duty at the age of seventy-six.